The New York Giants had been mired in mediocrity and out of the postseason for 17 consecutive years as they entered the 1981 NFL season. After winning two of their first three games in ’81, they lost two straight and were 2-3 as they prepared to take on the St. Louis Cardinals on October 11. But there was cause for optimism. The defense was strong, especially at linebacker where veterans Brad Van Pelt, Harry Carson, and Brian Kelley had been joined by first-round draft pick Lawrence Taylor, who was having an immediate impact. Third-year QB Phil Simms was still a promising work in progress. But a new factor was being introduced for the game against the Cardinals in the person of FB Rob Carpenter, who had just been received in a trade with the Houston Oilers with the hopes of improving the running game. The fifth-year veteran Carpenter had labored in the shadow of Houston’s great RB Earl Campbell and, other than his rookie season in the pre-Campbell year of 1977 when he ran the ball 144 times for 652 yards, he had not carried more than 97 times in any one campaign. His rushing total in 57 games for the Oilers was 1788 yards while averaging 4.1 yards per carry, although he had caught 43 passes in 1980. In the first four contests of the ’81 season before being traded, Carpenter carried the ball just 18 times for 74 yards. The visiting Cardinals, coached by Jim Hanifan, also came into the game at 2-3 after having beaten the Cowboys the previous week. RB Ottis Anderson was a well-established ground gainer in his third year and while 37-year-old veteran Jim Hart was still the starting quarterback, the promising Neil Lomax from Portland State had been drafted in the second round and was waiting in the wings. But while the offense had talent, the defense was a chronic source of problems. There were 67,128 fans at Giants Stadium and they witnessed a scoreless first quarter before a New York fumble set up a 14-yard touchdown pass from Hart to TE Doug Marsh seven seconds into the second quarter. The Giants responded with a 56-yard drive that ended with Joe Danelo kicking a 41-yard field goal to cut the St. Louis lead to 7-3. New York put together another scoring drive despite Simms being sacked twice along the way. 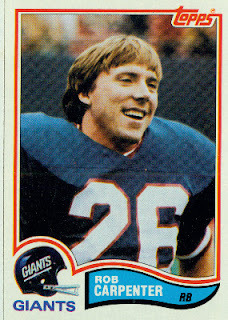 He threw to WR Johnny Perkins for a five-yard TD to put the Giants in front. An interception of a Hart pass by Brian Kelley set up another score before the half. Kelley returned the pickoff 16 yards to the St. Louis 33 and Simms again threw to Perkins for a touchdown, this time from seven yards out, with 31 seconds remaining in the second quarter. The Giants went into halftime with a 17-7 lead. Simms had thrown for 121 yards in the first half but was also sacked four times, at a cost of 22 yards. The Giants scored again to start the third quarter as Danelo booted a 45-yard field goal to make it 20-7. New York then took control when Marsh fumbled after catching a pass from Hart and FS Beasley Reece recovered for the Giants at the New York 45. The Giants capitalized when Simms tossed a 22-yard touchdown pass to WR Earnest Gray and it was 27-7 heading into the final period. The Cardinals narrowed the lead in the fourth quarter on a series highlighted by a Hart completion to WR Pat Tilley that picked up 34 yards. RB Theotis Brown capped the drive by running for a three-yard TD. But Carpenter crowned his debut with a 21-yard touchdown run that was set up in turn by a 24-yard carry by Simms. The Giants won handily by a score of 34-14. New York outgained the Cardinals by 377 yards to 285 – most impressively, 198 of that total for the Giants came on the ground. The Giants also had the edge in first downs by 27 to 19. The St. Louis defense sacked Simms five times in all, to four sacks recorded by the Giants, but the Cardinals also turned the ball over four times to one suffered by the home team. Rob Carpenter made an immediate impact with his new team by rushing for 103 yards on 14 carries that included a touchdown. Phil Simms (pictured below) completed 19 of 33 passes for 208 yards with three TDs and had none intercepted. Johnny Perkins led the receivers with 5 catches for 55 yards and two touchdowns. For the Cardinals, Jim Hart, who was replaced late in the fourth quarter by the rookie Lomax, was successful on 17 of 26 throws for 195 yards with a TD and an interception. Ottis Anderson ran for 71 yards on 17 attempts and also caught a team-leading 5 passes for 47 yards. Doug Marsh gained 52 yards on his four pass receptions that also included a touchdown. “It was the biggest game of the year for us,” summed up Phil Simms. “It was a great victory, the greatest since I’ve been here,” echoed Head Coach Ray Perkins of the Giants. With Carpenter adding a new dimension to the offense, the Giants went on to a 9-7 record to finish third in the NFC East and qualify for a Wild Card spot in the playoffs, thus making their first postseason appearance since 1963. They defeated the division-rival Eagles in the Wild Card round before succumbing to the 49ers in the Divisional playoff game. The Cardinals, with Lomax finishing out the year in place of Hart, ended up fifth in the division at 7-9. Rob Carpenter had his best year, rushing the ball 190 times for 748 yards in his ten games with the Giants and catching 24 passes for 201 more yards (overall, adding in his statistics with Houston, he gained 822 yards on 202 carries). He went over a hundred yards rushing in four games and added 161 yards on 33 carries in the Wild Card win over Philadelphia. 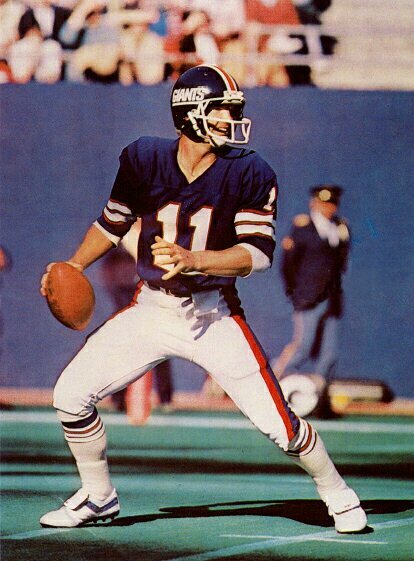 Phil Simms also played well until a shoulder injury ended his season prematurely in the tenth game. He passed for 2031 yards with 11 touchdowns and 9 interceptions, but it was Scott Brunner behind center for the 4-1 run at the end of the regular season and the playoff contests.